GREG BAKER/AFP/Getty ImagesChina’s Foreign Minister Wang Yi. 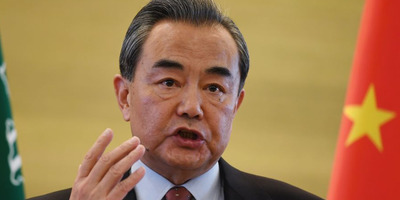 China’s foreign minister Wang Yi said on Thursday that history shows trade wars harm the initiator as well as the target. But only 1.1% of China’s steel exports end up in the US, so the tariffs are unlikely to have the effect Trump might desire. Speaking at China’s annual legislative meeting, the National People’s Congress, Wang spoke at length on Thursday about the need, and desire, for cooperation between the US and China. But, in the last of a three-part response to a question on Trump’s belief that China’s state economic model undermines international competition, Wang did not hold back. “As for our trade frictions, history teaches that trade war is never the right solution. In a globalized world it is particularly unhelpful as it will harm the initiator as well as the target country,” he said. “China and America do not have to be rivals,” Wang said. Photo by Win McNamee/Getty ImagesUS President Donald Trump in the White House after meeting with steel industry representatives last week. Wang was responding to Trump’s announcement of steep tariffs on steel and aluminium that has sparked fears of a trade war. While it was thought that the tariffs were targeted at Beijing, it may only have a limited effect because China exports just 1.1% of its steel to the US. In response, China is already looking into restrictions on US exports. “China’s development and revitalization is unstoppable, this is the consensus of the international community,” Wang said on Thursday.